It is never too early to start planning for your holiday gifts. deBebians is incredibly busy during the holiday season, so we like to encourage our customers to shop as early as possible. We even extend our 30-day return policy until January 15th to assist our customers in getting their shopping done early. We manufacture an extensive collection of fine jewelry that is appropriate to give a loved one during the holidays. Our halo jewelry is among our most popular items that we design and carry. A pair of halo studs with diamonds is easily among of the most versatile jewelry pieces that a woman can own. These earrings may be dressed up or dressed down and can be paired with virtually any outfit. The white diamond halo enhances the size of the center stone and enhances its beauty. 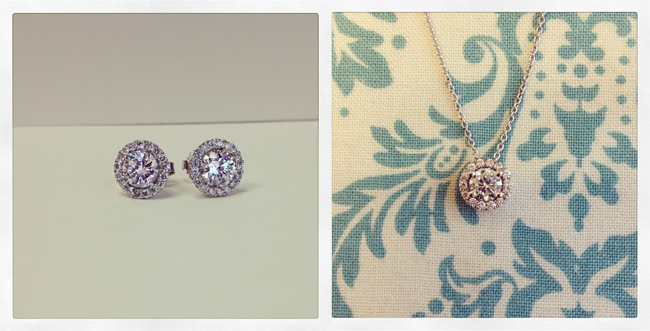 Our round diamond halo necklace is the perfect piece to accompany these diamond earrings. The halo may be set with a diamond that weighs 0.30 ct up to 2.00 ct.
For more ideas for jewelry to give your loved ones, please give our jewelry experts a call or consult our convenient gift guides.